Shirley Marianne Seliner (nee McLean), 91, of Granite City, IL, born December 29, 1925, in St. Louis, MO, died Tuesday, Aug. 29, 2017, at her home in Granite City, IL. In addition to being a wife, mother, grandmother, and great-grandmother, Shirley worked for several years as a sales associate in the China Department at Famous Barr in downtown St. Louis. 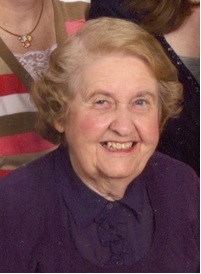 She was a member of St. Elizabeth Catholic Church in Granite City, IL and Hancock Alumni Association in Lemay, MO. She was preceded in death by her husband, James A. Seliner, whom she married July 29, 1950, at St. Andrew Catholic Church, Lemay, MO; her parents, Thomas and Elda (nee Reidel) McLean. Surviving are two daughters Antoinette M. and husband Richard Wood, of St. Louis, MO and Denise M. and husband Thomas Saksa of Edwardsville, IL; two sons, Patrick J. Seliner of Laguna Hills, CA and Jack Seliner and wife Laura Seliner of Freeburg, IL; grandchildren Tommy (Victoria) Saksa of IL, Jamie (Gregory) Bowne of GA, Angelique (Carlos) Lichtenberg of MO, Jeremy Seliner of CA, Joshua Seliner of CA, Robert (Samantha) Lichtenberg of MO, Benjamin Seliner of CA, Ian and Evan Seliner of IL; and great-grandchildren, Sammi, Alex, Nicole, Gabriel, Benny, Cohen, and Arwyn; sister Jacqueline Schooley (nee McLean) and many nieces and nephews. Prayer Service at 4 p.m. Visitation immediately following until 8 p.m. August 31, 2017, at Thomas Saksa Funeral Home, Granite City, IL. Funeral: Funeral Mass will be held at 11 a.m. Friday, September 1, 2017, at St. Elizabeth’s Catholic Church, Granite City, IL, with Reverend Zachary Edgar officiating. Burial will be in Calvary Cemetery, Edwardsville, IL.